Bench for the garden, originally uploaded by the workroom. Have you ever done something crazy for love? I have. Too many times to count. Most often it involved something I had found at the side of the road. I guess I am what some people refer to as a ‘dumpster diver’ or my new favourite, ‘urban forager’. I love to find stuff at the side of the road and bring it home. My house and now the shop are filled with these found treasures. How can people throw this amazing stuff away? But, thank goodness they do! What is even better than finding some random thing, is finding exactly the thing you had been hoping for. I have had this experience many times. Some people call this manifestation or the power of ‘The Secret’. One of my former roommates was an astrologist and she used to say that I have a very close connection to my spiritual guide. Thus, the things I asked the universe for were more often delivered than the average Jill. All I know is that it has happened over and over again. The universe delivered to me again yesterday. 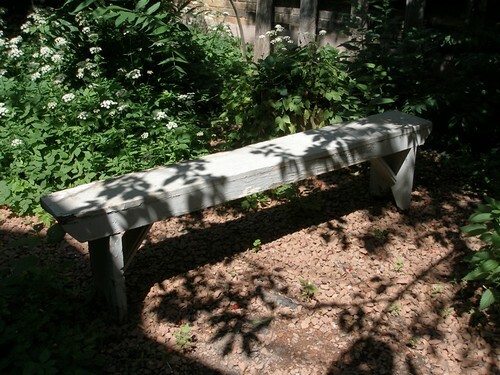 I had been thinking very hard about a bench for the back garden at the workroom. I knew exactly the style I was hoping for, just a simple homemade-looking bench. At the corner of Brock & Chesley, I found my bench. Not only is it the exact construction I was hoping for, but it is painted in my favourite colour, grey. Over the years, I have made a few rules with myself about finding stuff and what I’m allowed to bring home with me. As a general rule, I need to be able to carry the item by myself or be able to throw it into the trunk of a cab. This bench is six feet long, so cab was out of the question. I took a deep breath and picked up the bench. It wasn’t THAT heavy. Mind you, I did also have a dog (Maisy) on a leash and two tote bags. It’s quite a hike from Chesley Avenue down to Queen Street, along Brock. It’s 1.5 km according to Google Maps. I definitely felt like a crazy lady and today I feel sore all over. But really, there was no way I could leave that bench behind. We were meant to be together. Congrats on the free bench! Score! I’m not the only one, I see. I rescued a wooden plant stand from the garbage the other day and toted it home during my morning walk. It was just a couple of short blocks, though, not a kilometre and a half!! I count that mug I found that is EXACTLY like yours as one of those special deliveries. I had never even seen a mug like that before I had seen yours. toronto is the best for garbage picking! it was a revelation when i moved there. i just can’t believe what people get rid of. i also like the city’s collective agreement to put things out for others instead of bagging them up for the landfill. Here’s one for you… Both of my children as babies slept in a lovely wooden crib that my dad brought home from the city dump in Michigan. Someone had left it, it’s panels neatly stacked with all its hardware intact, leaning against one the the buildings at the dump. I’ll bet they were hoping someone would grab it and use it. We did! Dad replaced a covering on a side rail and we bought a fresh mattress. It served us very well. Becky – I first encountered this communal ‘exchange’ system in New York, where people would leave stacks of books out on their brownstone steps for others to pick up.I was so intrigued by this concept, but fully embraced it. J – How cool about the crib. It is so much fun to hear about everyone’s tales of found stuff.